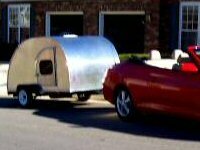 Teardrops n Tiny Travel Trailers • View topic - Coleman Portable Shower - Modifications???? Coleman Portable Shower - Modifications???? I even remember reading someone had modified the shower head with a different type outlet. I can't seem to find that post now. If anyone has modifed this unit, or installed it, I would appreciate some pics. I picked this unit up at my local BX, the price was right, figured it would be worth trying to use as a water pump. Re: Coleman Portable Shower - Modifications???? EZ did something like that and I think Ira did too. "If you can't be a good example, then you'll just have to be a horrible warning"
fornesto did the modified version. Last edited by Loader on Mon Jul 10, 2006 10:45 am, edited 1 time in total. It pumps well with plenty (too much) pressure. I just pinched off part of the hose to regulate. Works well for me (not much use yet) and for $20 I have dual-powered running water. Thank's a lot. Just what I was looking for. I decided to just use it as is, nestled in a hole, so I can pull it out to the side to use also as a shower. I think this makes for easier dishwashing too, more convenient than a fixed faucet. Ed, if it's connected to a faucet, is the faucet always on? Also, on your unit, can you lower the pressure on the unit itself? And Earl, on the Coleman, there's "writing" on there that you can adjust the pressure, but nothing in the manual about it. Have you played with this at all? And have you given any thought how to mount the footswitch? Last edited by Ira on Mon Jul 10, 2006 2:09 pm, edited 1 time in total. The only adjusting I found is on shower head itself. You rotate the the nozzle, and the stream changes from the inner to outer ring of holes. (Hope that makes sense). As for mounting the base, haven't looked real close as to where to put it. You? I didn't even realize that about the pressure adjustment--I thought you had to play with the center screw there. I just thought it was weird that the manual didn't mention anything about adjusting the pressure. It's just that the power base doesn't have any handy holes to just screw into for mounting. Like, we would need some kind of straps/bracket to mount it under-counter or on a side wall. Idea just came to me, I'll have to look at it closer when I get home, but what about cutting a hole just large enough for the switch in the counter, and install the base onto a shelf, bracket, or the like you attach to the under side of the counter? It would be some work, but it might be the result needed? That's the thing, Earl--I don't want to cut a hole which would "marry" me to it forever. Know what I mean? I would rather have it upside down on the underside of the counter. So if I ever want to ditch it for the Hot Water on Demand, I didn't commit a hole in the countertop for it. Understand, no hole. I guess I'll be sitting on the pondering stool this evening trying to figure out where to mount the thing. Good thing there is a beer or 3 in the fridge. Loader wrote: Good thing there is a beer or 3 in the fridge. I gotta pickup a few. Ira, if you look at my pic you will see a pull-on switch (bilge pump switch?) from the boating supply place to turn on the water. Of course that required a hole and you don't want a hole. Hmmmmm. EZ wrote: Ira, if you look at my pic you will see a pull-on switch (bilge pump switch?) from the boating supply place to turn on the water. Of course that required a hole and you don't want a hole. Hmmmmm. Oh--now I got you. I didn't look closely before--it's a facuet without a handle. mount a similar push pull switch under the cabinet so you can pull on and push off with your body if your hands are wet.